The Lunar Magic spells are a powerful set of magic spells which you have access to after completing the Lunar Diplomacy Quest. These spells give you the ability to heal players, teleport to various locations, get information about the opponents you are fighting, make items and more. This guide will teach you about this group of spells and how to use them. First things first: you need to switch to the Lunar spellbook in order to use it. If you have completed the Lunar Diplomacy quest (which is required to use the spells) then you should know how to get to Lunar Isle, the home of the Moonclan. Your first option is to get to Rellekka and then talk to Lokar Searunner to take the boat to the Pirates' Cove. Make sure you have your Seal of Passage though! From there, talk to Captain Bentley to be transported to Lunar Isle. From the boat, head south until you cross a bridge, and then head east to the Astral Altar. 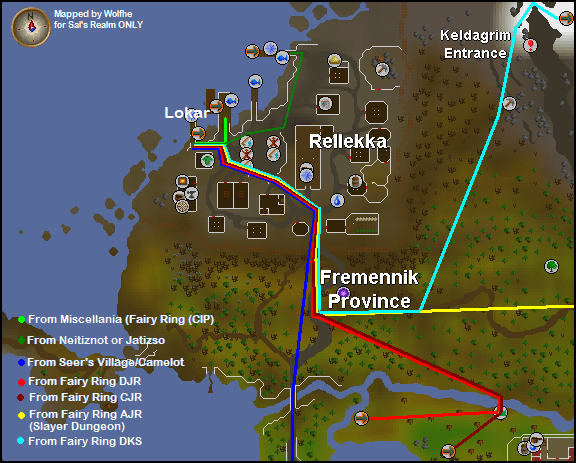 There are several ways to get to Rellekka, but the most efficient ways are undoubtedly the use of either the Fairy Rings (which requires completion of the quest, A Fairy Tale Part 2) or using an Enchanted Lyre. There are many Fairy Rings to choose from near Rellekka, but the closest is Fairy Ring CIP, on Miscellania. An upside to this Fairy Ring is that you can check your coffers and collect your resources from your Kingdom before setting out to switch to Lunar Magic. The most common way to get to Rellekka is by teleporting to Camelot and then walking north for a long distance until you reach Rellekka. This method takes a considerable amount of time, and is only for those who have no other way to get there. Your other option is to find another player with at least level 70 Magic (and who already has the Lunar Spellbook set), and ask them to cast Tele Group Moonclan. If you have accept aid turned on and you are within one square of the player casting the spell, you should be asked if you would like to be teleported to Lunar Isle. Accept, and you will end up just inside the gates of the town. From there, run south to the Astral Altar. However, if you have not completed Lunar Diplomacy, you will not be able to be teleported to Lunar Isle. Alternatively, if you already have your spellbook set to Lunar spells and you have at least level 69 Magic, you can cast the Teleport Moonclan spell to teleport to the same place that the Tele Group Moonclan spell places you. Finally, you can cast the Home teleport spell in the Lunar Spellbook, which requires no runes. The only drawback to this is that it cannot be used again for a 30 minute time period. 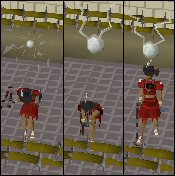 The Home Teleport Spell will place you just outside the bank on Lunar Isle. Every single Lunar spell uses at least one astral rune. These special runes can only be created by crafting pure essence into runes at the Astral Altar, located on the southern tip of Lunar Isle. 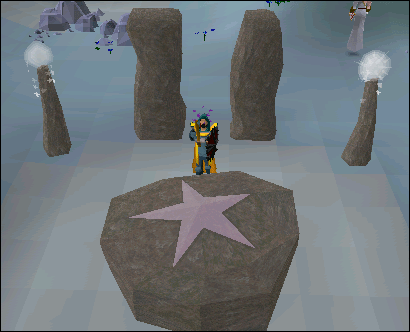 The Altar is unique in that fact that it is one of only two special Runecrafting altars that do not require a talisman or tiara to access them. Unfortunately, you cannot access the Lunar Altar from the Abyss, as is the case with the Ourania Altar. The other important thing that you can do at this altar is to switch to your Lunar spellbook. 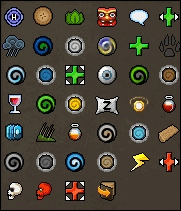 Right-click on the altar to get the Swap Spellbook option. Choosing this option causes your Modern Magic spellbook to be replaced with the Lunar one. Unlike the altar for Ancient Magicks your prayer does not drain, so you can switch between Modern and Lunar spells as much as you want with no worries. The Lunar spells are separated into three categories, depending on their use. These three spells will allow you to cure another player, yourself or a group of people of poison. Cure Other can be cast on another player who is poisoned, Cure Me can be cast on yourself if you are poisoned, and Cure Group will cure anyone standing within one square of you of poison. These two spells will transfer Life Points from your character to another player or a group. Heal Other transfers up to 75% of your Life Points to another player, while Heal Group transfers up to 75% of your Life Points to anyone standing within one square of your character. This spell will quickly bake all of the unbaked pies in your inventory. When cast on a diseased farming patch, the patch will become free of disease without the use of a plant cure. This spell can be cast on any monster in the game. 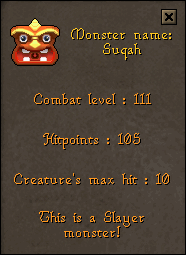 When cast, a screen will show up in your spellbook telling you the monster's combat level, Life Points, Max Hit, whether or not the monster is a Slayer Monster and any specific characteristics the monster may have, such as immunity to poison. This spell can only be used after the completion of the Dream Mentor quest. 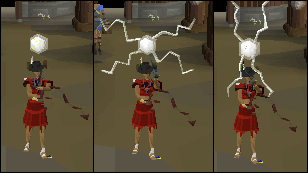 This spell will allow you to contact one of any number of NPCs (Non Playable Characters), including Honest Jimmy, Bert the Sandman, Advisor Ghrim, Turael the Slayer Master, Lanthus, Mazchna the Slayer Master, Duradel the Slayer Master, Vannaka the Slayer Master, Murphy, Chaeldar the Slayer Master, Cyrisus (from Dream Mentor) and a Random NPC (Which can include the Wise Old Man, talking sheep, talking cows, or many others). If you choose to contact Advisor Ghrim, then you can only choose to collect gathered resources; you cannot withdraw or deposit money into the coffers. 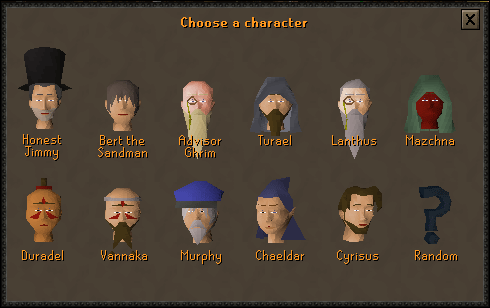 You must complete Hand in the Sand to speak to Bert the Sandman, Throne of Miscellania to speak to Advisor Ghrim and start Dream Mentor to speak to Cyrisus. When cast, every empty water vessel in your inventory will be filled with water. Certain quest specific items cannot be filled in this manner. The most notable use of this spell, besides quickly filling vials with water, is for training your Magic level. The experience you receive per cast is that same as that of High Level Alchemy, but using the Esc key and the F6 key you can quickly switch back and forth between your spellbook and your inventory. This allows you to cast the spell, return to your inventory and and empty a vial, and then return to your spellbook and cast the spell again slightly faster than the amount of time it takes for one High Level Alchemy cast. Unfortunately, you don't receive any of the cost back, so you will always lose money. However, if you buy empty vials off the Grand Exchange, cast Humidify on them, and then sell the water-filled vials on the Grand Exchange for more money than you bought the vials for, it is possible to make a profit. The only way to make a profit is if you mine your own pure essence and craft all of you own astral runes, though. This spell can only be used after completion of the Dream Mentor quest. When cast, a Hunter Kit will appear in your inventory. This Kit, when opened, contains basic Hunter supplies including: a box trap, a butterfly net, a bird snare, a noose wand, a rabbit snare, a teasing stick and an unlit torch. The Hunter Kit itself is untradable. This spell can only be used after completion of the Dream Mentor quest. When cast on another player, a window will come up in your spellbook showing all of that player's stats. This spell can only be used after completion of the Dream Mentor quest. This spell will turn all buckets of sand and soda ash/seaweed in your inventory into molten glass, without the use of a furnace. Though this method of creating molten glass destroys the buckets, it creates about 33% more molten glass. One cast will turn all of the sand and soda ash/seaweed in your inventory into molten glass. When this spell is cast, your character will sit down on the ground and fall asleep. While in the sleep state, you recover Life Points approximately three times faster than normally. Combat or poison will bring you out of the sleep state. This spell can only be used after completion of the Dream Mentor quest. When this spell is cast, all of the unstrung amulets in your inventory will be strung, without the need for balls of wool. One set of runes is used for every amulet. When Stat Restore Pot Share is cast on a Prayer Restore, Energy Restore, Super Energy Restore, Stat Restore or Super Stat Restore Potion, it will share it with up to four other people within one square of you. When Boost Pot Share is cast on an Attack, Super Attack, Strength, Super Strength, Defence, Super Defence, Ranging, Magic, Fishing or Agility Potion, the potion will be shared with up to four other people within one square of you. This spell allows you to combine runes without the use of a talisman. When cast on a weeded Farming patch, the patch will be fertilized with supercompost. Each cast of this spell will convert a single log into a plank. 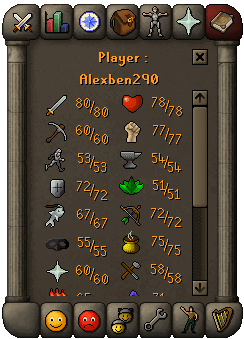 To turn a regular log into a plank, you will need 70gp. 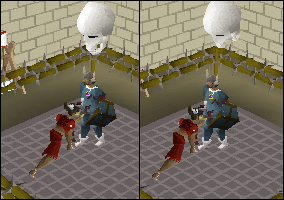 To turn an Oak log into a plank, you will need 175gp. 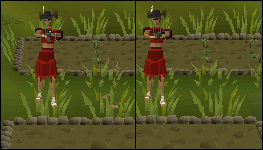 To turn a Teak log into a plank, you will need 350gp. To turn a Mahogany log into a plank, you will need 1050gp. This spell can only be used after completion of the Dream Mentor quest. This spell will deal you a small amount of damage in order to transfer some of your run energy and all of your special attack energy to the player the spell is cast on. This spell is cast on another player, giving that player the power of Vengeance. Vengeance works much like a Ring of Recoil, but it is considerably more powerful. When a player with the power of Vengeance gets hit, 75% of the damage done to the player is rebounded to the attacker. This spell will give you the power of Vengeance. Vengeance works much like a Ring of Recoil, but it is considerably more powerful. When a player with the power of Vengeance gets hit, 75% of the damage done to the player is rebounded to the attacker. This spell will allow you to switch to another spellbook in order to cast a single spell. For instance, a player can cast spellbook swap to switch to the Modern spellbook and then use a teleport from that spellbook, or the player can switch to the Ancient spellbook for a single cast of Ice Barrage. 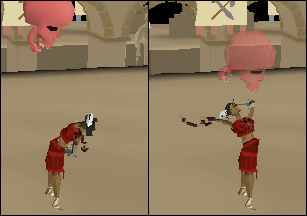 Please note that the Ancient spellbook can only be used if you have completed the Desert Treasure quest. This spell can only be used after completion of the Dream Mentor quest. 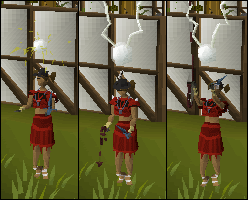 This useful spell will teleport you just outside the bank on Lunar Isle. It requires no runes or magic level, but it gives no experience. The only drawback to this spell is that it requires a recharging time of 30 minutes after use. This spell is interrupted by combat or poison. These spells will teleport you to one of any number of places. You are the only person who is teleported. Places you can teleport to include: Lunar Isle, Ourania (Near the ZMI Altar), Waterbirth Island, the Barbarian Outpost (near Barbarian Assault and the Agility Course), Port Khazard, Just outside the Fishing Guild, Catherby, and the Ice Plateau (in Level 53 Wilderness). These spells will teleport you and anyone standing within one square of you to your chosen destination. A person will only be teleported if they are within one square of the person casting the spell and they have accept aid turned 'on'. 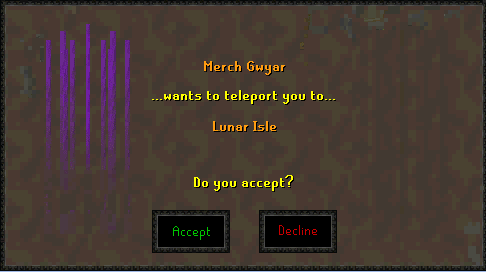 Only those who have completed Lunar Diplomacy can be teleported to Lunar Isle. 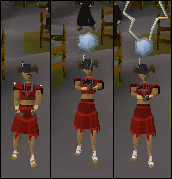 Places you can teleport/be teleported to include: Lunar Isle, Waterbirth Island, the Barbarian Outpost (near Barbarian Assault and the Agility Course), Port Khazard, Just outside the Fishing Guild, Catherby, and the Ice Plateau (in Level 53 Wilderness). The requirements for each spell and the experience given for casting them are shown below. 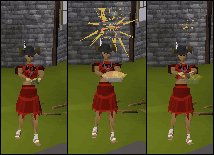 Bake Pie 65 1 Astral,5 Fire,4 Water 60 + relevant Cooking exp. * Only accessible after completion of the Dream Mentor Quest. *** You need 70gp for each plank, 175gp for each each oak plank, 350gp for each teak plank, and 1050gp for each mahogany plank. Each cast makes one log into a plank.